All models sport updated front and rear fascia styling. All models feature new headlamp and taillight designs. All models include updated interior fittings, including a newly designed instrument panel, air conditioning controls and steering wheel. Safety is enhanced on all models with a backup camera as standard. Show off your advanced, urban style. 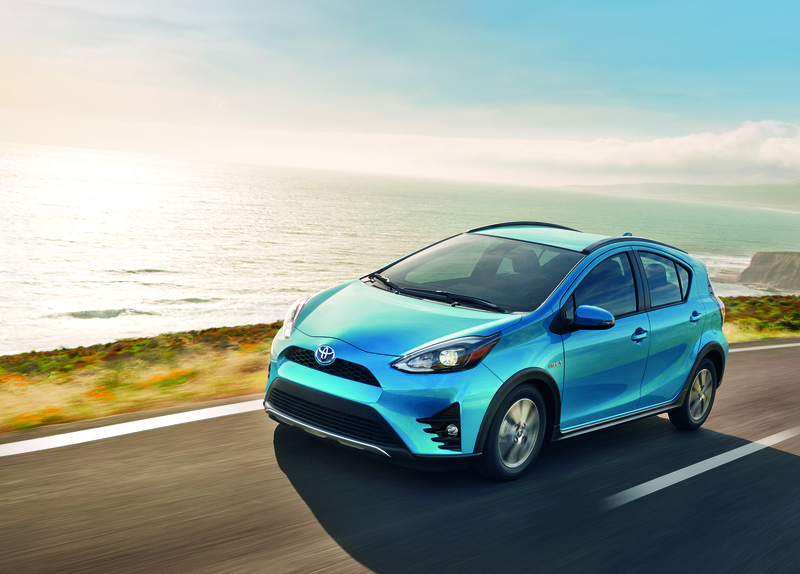 With the Prius c’s updated design, it’s the hybrid that stands out from the competition. In fact, it’s in a class by itself – with aerodynamic styling that slips through the wind for maximum efficiency and smooth, quieter driving. A front lower bumper spoiler and rear spoiler help guide air around the vehicle, even as they ramp up the style, while LED headlamps and taillights express Prius c’s advanced attitude. Prius c’s hatchback design serves up big helpings of versatility. The modern and comfortable cabin offers plenty of space for up to five adults. Or, drop the 60/40 split folding rear seat and open up room for an impressive amount of cargo. Every Prius c comes standard equipped with many comfort and convenience features, including air conditioning with automatic temperature control, 4.2” MID display, multi-information display, outside temperature gauge, power door locks and windows with driver’s auto up/down function, plenty of thoughtful in-cabin storage, 12v accessory power outlet, power adjustable heated exterior mirrors, a rear wiper/washer, keyless entry, a steering wheel mounted on a tilting/telescoping column and fitted with controls for audio and HVAC systems, and more. Under the hood, the Prius c’s Hybrid Synergy Drive is built around a 1.5L Atkinson cycle four-cylinder engine with an exhaust heat recovery system, Variable Valve Timing with intelligence, and other advanced systems. The hybrid system generates 99 net horsepower plus impressive fuel efficiency of just 5.1 L/ 100km city/highway combined, while the continuously variable transmission gives Prius c quick and smooth acceleration. The front-wheel-drive Prius c features responsive and efficient electric power steering, and rides on a suspension system featuring Macpherson gas struts and a stabilizer bar up front, and a torsion beam suspension at the rear. Every Prius c also features a long list of cutting-edge active and passive safety systems as standard on all models. This is headlined by Toyota Safety Sense C – a bundle of advanced safety systems including the Pre-Collision System… Lane Departure Alert… and Automatic High Beams. Other features include the six active technologies of the Toyota Star Safety System, nine standard airbags, direct tire pressure monitoring system, LED brake lamps, and – new for 2018 – a backup camera on all models. The 2018 Toyota Prius c (Starting MSRP: $21,990) features a 6.1” Display Audio System with Bluetooth connectivity, four speakers, and shark-fin antenna, fabric seat surfaces, 15” steel wheels, and more. This model may be enhanced with an available Upgrade Package (Starting MSRP: $22,890), which includes a six-speaker audio system, premium seat coverings, additional adjustments on the driver’s seat, cruise control, a synthetic leather instrument panel, tonneau cover, rear center console box, and more. The 2018 Toyota Prius c Technology (Starting MSRP: $26,950) adds many technology features and upgrades, including a six-speaker 6.1” Display Audio System with navigation, Bluetooth connectivity, Integrated Sirius XM Satellite Radio, advanced voice recognition, Gracenote connectivity, and shark-fin antenna, Touch Tracer controls on the steering wheel, and the Smart Key System with push Button Start. Other features on this model include heated front seats, Softex seat surfaces, synthetic leather-clad instrument panel and steering wheel, tonneau cover, cruise control, power moonroof, LED fog lamps, 15” aluminum alloy wheels, and more. The 2018 Toyota Prius c is now on sale at Toyota Dealers across Canada. For complete and up to date details and specifications, visit www.toyota.ca/priusc.